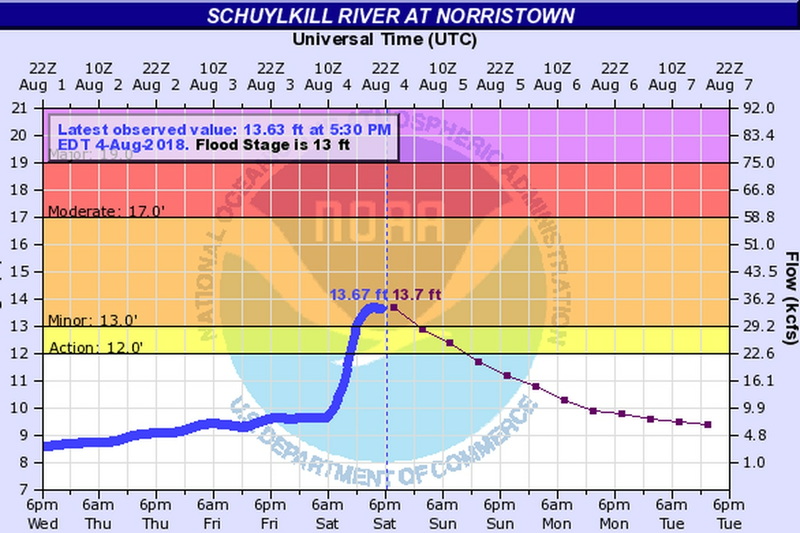 Graph showing stage of Schuylkill at Norristown. The Schuylkill at Norristown has sloshed over its banks, prompting the National Weather Service to issue a flood warning effective until 7:15 a.m. Sunday. At 6 p.m. Saturday the river reached a crest of 13.7 feet; when the waters hit flood stage, 13 feet, it seeps onto Riverview Boulevard in West Norriton Township, the weather service said. The river was forecast to remain above flood stage until the early-morning hours and remain above the "action" level until about noon, but Dean Iovino, a meteorologist at the weather service office in Mount Holly, said no major flooding was expected. West Norriton, which has dozens of homes along the banks of the Schuylkill, has been a perennial leader in National Flood Insurance Program claims. Philadelphia residents might find it puzzling that a flood warning would have been issued anywhere around here. Only about a tenth of an inch was measured officially at Philadelphia International Airport. The rain action was to the north an west of the region. The flood warning was the result of the Schuylkill's response to downpours upriver in Berks County earlier Saturday, said Iovino. Over 2 inches of rain was measured at Reading — a record for an Aug. 4 — and he said said some areas got doused with 3 and 4 inches. During the last month rainfall generally has been above normal in the Philadelphia region, but the atmosphere has had a particular pick on areas not all that far away. In Philadelphia, for example, in the 30-day period that ended Friday, just over 5 inches had fallen. But over 10 inches was recorded in Berks County stations, and 11-plus inches in Schuylkill County. The Schuylkill is expected to drop back below flood stage later Saturday night. Meanwhile, no rain is expected on Sunday, although it will be sultry, with highs in the 90s, and the air won't be particularly invigorating. With steamy sunshine and light winds, the New Jersey Department of Environmental Protection has issued a "code orange" air quality alert for all but the northern third of the Garden State. The gray shading denotes a “code orange” air quality alert; the green, flood alert.